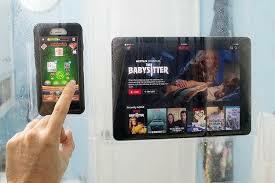 TAKE YOUR TABLET WITH YOU TO THE SHOWER! Now you’ll never be separated from your smart phone or tablet! Is this a great idea, or have we become waaaayyyy too attached to our electronic devices? Next story SEE COLE SWINDELL IN CONCERT!